Our holy father Alipius of the Caves was the follower of St. Luke the Evangelist. 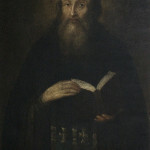 He wondrously depicted the faces of saints on icons. At the same time, many of their virtues were imprinted in his soul. Besides, St. Alipius was a wonderworking healer. 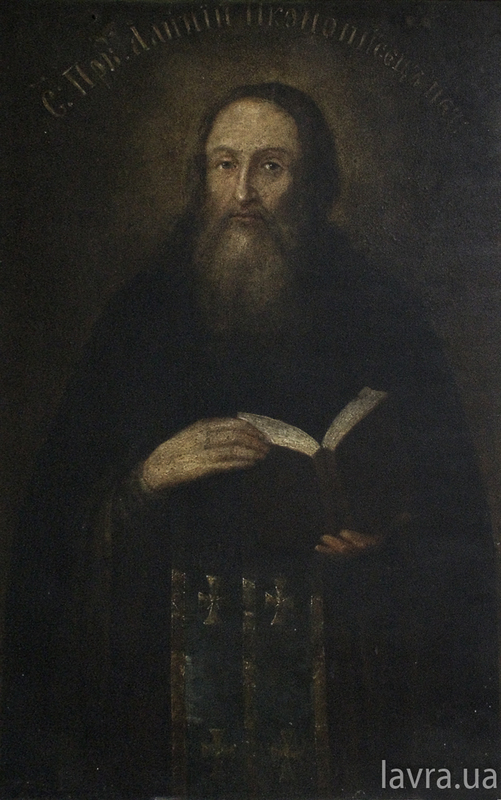 In the reign of the faithful Prince Vsevolod Yaroslavovich of Kiev, in the abbacy of St. Nikon, God called Greek icon painters from Constantinople to the Cave Monastery. St. Alipius’ parents gave the youth over to the icon painters for him to learn their art. While working with them, the young man witnessed an unbelievable miracle: when the masters were painting in the sanctuary the icon of the Most Holy Theotokos appeared spontaneously, shining like the sun; the dove flew out of Her mouth and flew into the mouth of the Saviour on the nearby icon. From that time, St. Alipius knew that the Holy Spirit abided at the Cave church. After the church had been decorated, St. Alipius received the Holy Sacrament of tonsure from the abbot, St. Nikon. His iconographic skills continued to develop. The monk mastered iconography for the sake of gaining virtues but not for his own enrichment. By God’s grace, St. Alipius was able to depict virtuous images of saints on their icons. He painted icons free for anyone who asked. The saint was never idle; by his hard work he imitated the ancient fathers who never ceased their handicraft works. 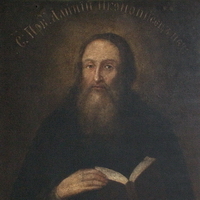 If the saint happened to get a reward for his work, he divided it into the three equal parts: for materials for icons, for the poor and for the needs of the monastery. He gave himself rest neither day nor night; at night, he remained in vigil, praying with endless prostrations. 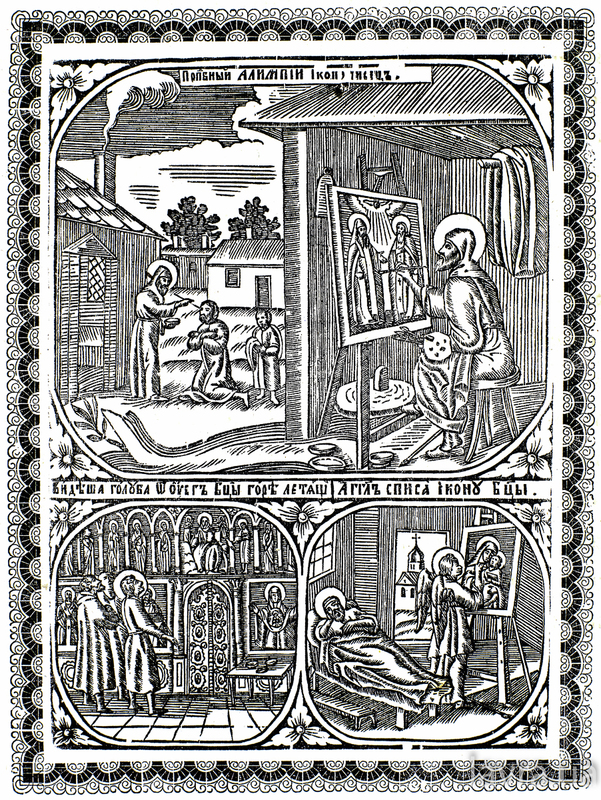 Admitting all these virtues in the saint icon painter, the abbot decided to elevate him to the priesthood. St. Alipius became as a lamp placed upon a lamp stand; he increased the beauty of the priesthood with pure monastic virtues. He became known for his wonderworking. 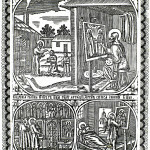 A wealthy citizen of Kiev suffered from leprosy. He sought for help from various doctors, magi, sorcerer, and even heterodox healers, but they brought him no relief. He was getting even worse. Then, one of his friends advised him to go to the Cave Monastery and ask the fathers for help. The ill man did not really take the advice seriously and set out for the Caves almost unwillingly. When he arrived, the abbot ordered the brothers to give him some water to drink from the well of St. Theodosius and to anoint his head and face. Broken by his grief and sorrow, the man daily awaited for his death. Finally, however, he came to his senses and decided to confess his sins. He somehow managed to get to the Cave Monastery and confessed to St. Alipius. The saint told him, ‘You have done well to confess your sins to God, before my unworthy self, for so did the prophet, Into Your hand I commit my spirit; You have ransomed me, Oh Lord, God of truth (Ps. 31, 5). The saint taught the repentant sinner how he could save his soul. Later, he anointed the putrid sores with some iconographic paint. St. Alipius took the man to the church, gave him the Holy Communion and ordered him to wash his face with water used by the priests to wash their faces after the Communion. The scabs immediately fell off his skin and the healthy complexion returned to his face. Thus, our holy father Alipius was a wonderworker following Jesus Christ. Christ had healed the leper and then ordered him to bring an offering for his cleansing before the priests; in the same way St. Alipius ordered the leper to come before the priests and bring a gift of which the prophet speaks, What shall I return to Lord for all his goodness to me? I will lift up the cup of salvation (Ps. 115, 3-4). ‘Brethren! Heed what is said, No one can serve two masters (Mt. 6, 24). For this man had previously been a slave of sin and applied to magic first. Later, he came here to God but was careless in his salvation and did not believe in the Lord Who is the only Saviour. Therefore, his illness grew stronger and attacked him all the worse because of his unbelief, for the Lord said, But when he asks, he must believe and not doubt (Mt. 7, 7). Having heard that, people bowed and went away with the healed man glorifying God, His Holy Mother, Reverend Fathers Anthony and Theodosius as well as their disciple, St. Alipius. was no painting on them. The monks receiving the order were invited as witnesses. The brothers that were sent for the boards came to the storeroom and, instead of plain boards, they saw seven beautifully painted icons there. They brought them to the room where the abbot and those gathered had been waiting. Everyone fell trembling down face to the floor in astonishment. They reverenced to the miraculous icons. Meanwhile, the two slanderers arrived knowing nothing of the miracle. They began to accuse St. Alipius that he had taken the three measures of silver but did not paint the icons. At this, the wondrous icons were brought forth and the abbot said, ‘Here now are these icons, painted by God Himself Who testifies of Alipius’ meekness.’ When they saw the miracle they were horrified. The abbot reproached them for their unjust deed and sent them out of the monastery. It once happened that the Podol district of Kiev burned down. The church where the seven miraculous icons were kept was also burned. After the fire, the icons were found completely unharmed. The fact was reported to the prince and he came to see the miracle. Hearing how they were painted in one night by God’s will in order to justify St. Alipius, Vladimir Monomakh glorified God. The prince took one of these icons, the one of Theotokos, and sent it to the new stone church built in Rostov. 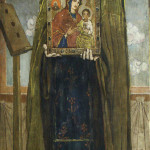 The icon was miraculously preserved in two similar occasions. The saint told them that he had seen an angel painting the icon. That same angel was there, ready to take him away. With these words the saint gave up his soul into the hands of the Lord on August 17 (by old style). The brethren tidied his body, carried it into the church and, having chanted the service over him, placed him in the cave of St. Anthony. Thus, the holy wonderworking icon painter adorned heaven and earth, honouring the Icon painter-creator, God the Father, Who said, Let Us make man in Our image, after Our likeness (Gen. 1, 26) and the image of His Incarnation, God the Son, Who took on the image Himself together with the Holy Spirit Who came down in the image of a dove and of fiery tongues. May we in unison with the Holy Father Alipius, praise Them Who are One in Essence in endless ages of ages. Amen!